This story is based on the original work done by Ricki Strapp. 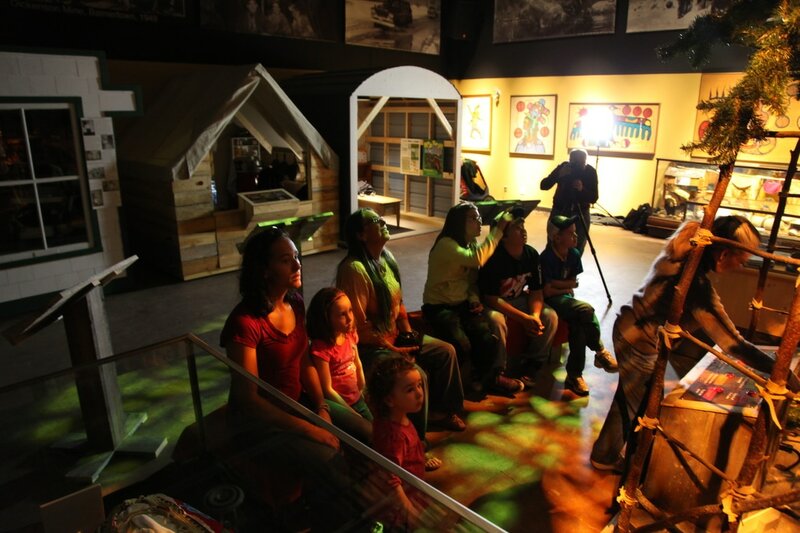 The Red Lake Heritage Centre's story begins with a log cabin. 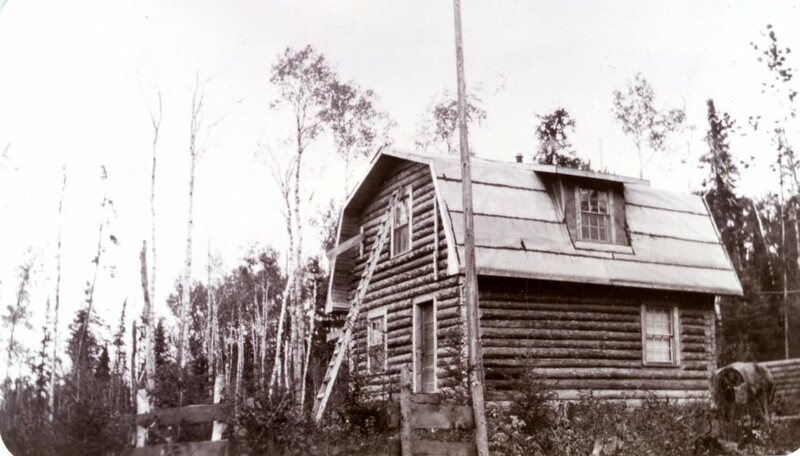 This cabin was built by Gustav Einar Erickson (1895 – 1984) a young Swedish man, during the summer of 1929 at Sam’s Portage. Erickson had come to the area to operate the marine steam hoist and got the contract to build this cabin by Albert McGraw (1880 – 1966), the superintendent of the Red Lake Marine Portage Company Ltd. Sam’s Portage was on of four portages between Hudson and Red Lake. The cabin was abandoned in 1947 when highway 105 was built from Vermilion Bay to Red Lake. With the introduction of the road north and the limited need for moving goods and people by boat, the portages were put out of commission. In the early 1970s, the cabin was chosen to house a proposed Red Lake District Museum. The building, being in a terrible state of decay, needed some serious restoration. In the late 70s, Red Lake Councillor Mike Kudlowsky, together with Swedish pioneer lumberman John Gustafson, took on the major task of moving, and restoring this cabin. Eventually the cabin was successfully moved, log by log, 30 miles from Sam’s Portage to its new location next to the tourist bureau. By the end of that summer, a Museum committee had been formed. The members included John Gustafson, George Aiken, Tim Smith, Dave Harvey and Margaret McDougall. The committee was expected to investigate the historical artifact resources in the community and prepare the museum for operation the following summer. Officially becoming recognized as a museum in 1982, the facility was run by a young student named John Ritchhammer during the summer. John started the lengthy process of compiling stories, photographs and object for the museum's collection. 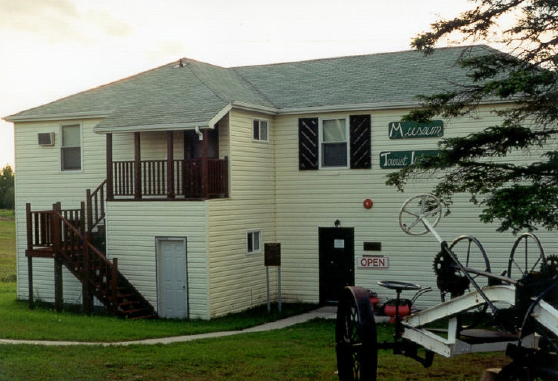 By 1986, the one room cabin had become overcrowded and too small to support the numerous artifacts that the museum was collecting. 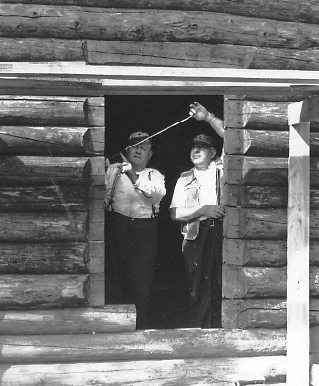 Although hundreds of volunteer hours were spent trying to upgrade and maintain the log building, it eventually was decided a new museum needed to be found. Under the chairmanship of Jack McEwen, the Museum Board was able to acquire the old mine rescue station building which had been donated to the township. 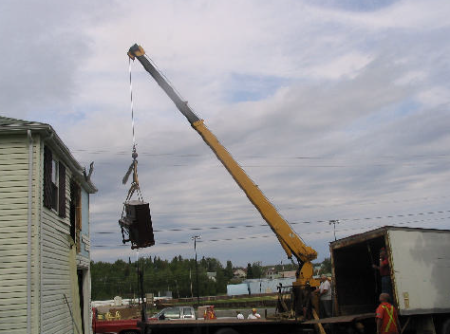 On Feb 26th, 1995 the rescue station had its roof removed and was lifted from its foundation. The station was moved to its new site on the grounds at Centennial Park. This was to be the new home for the Red Lake Museum and the log cabin was to be primarily used for storage. For the next four years, the rescue station continued to serve as Red Lake’s Museum. In 1999, Council realized it was time to make a decision about the fate of the museum. The concept of a modern Heritage Centre, a place that would become a major regional tourist attraction and would serve as an important cultural facility for Red Lake residents, soon took shape. The building was designed by Corbett Cibinel Architects, and integrated four simple elements: rough stone, heavy timber, metal and glass. The lobby of the building was meant to give the impression of walking through an underground mining drift. The main gallery started only as a rough open space with great potential. 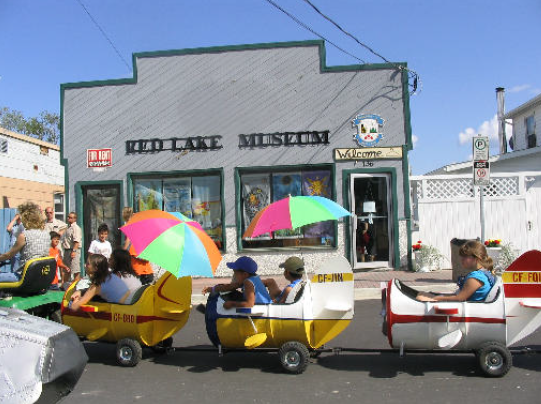 In 2003 the Red Lake Museum along with its dedicated volunteers, began the tedious task of organizing each artifact for storage or relocation to a temporary location in downtown Red Lake. The majority of the collection was put into storage and a temporary museum office was set up along with a small display of artifacts. 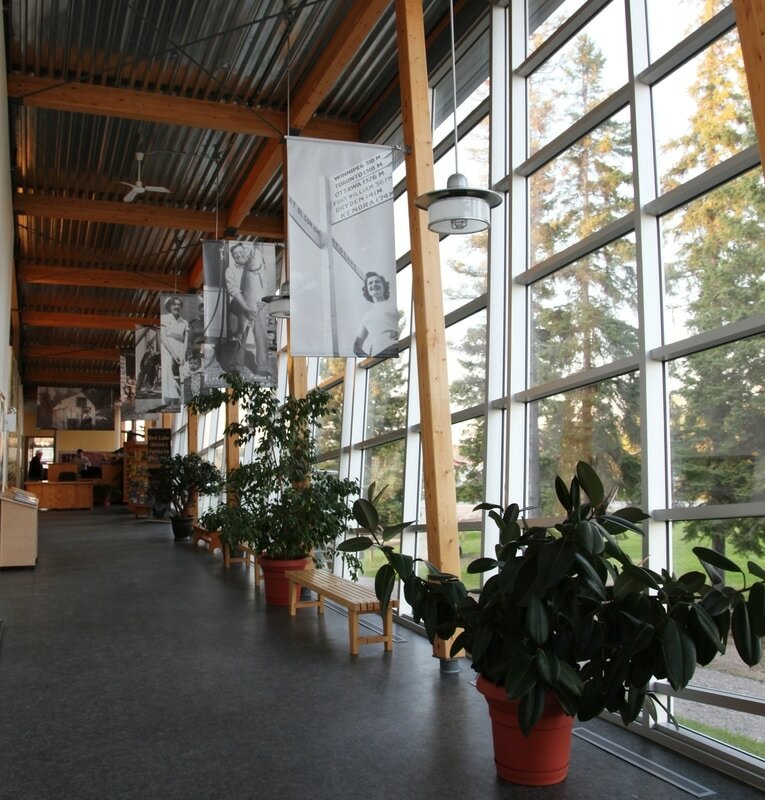 The Red Lake Regional Heritage Centre officially opened in May 2005. Local teachers were interested in contributing to the Heritage Centre. Angela McLaren and Rhonda Bobinski (Beckman) developed education programs that linked the history of the area to the Ontario School Curriculum. When tragedy struck and the Ministry building caught fire and burned down, the Heritage Centre became a temporary office for many of its agencies. This meant transforming gallery space into offices. The Ministry of Northern Development and Mining and Service Ontario occupied the Heritage Centre until a new Ministry building was constructed. In 2008, Science North helped modernize the gallery space including constructing exhibits, developing a theatre display, and updating the room's lighting. Through a significant effort the Heritage Centre's exhibit space was transformed from a raw idea into a beautiful interactive gallery. The Heritage Centre has become the pride of the community of Red Lake. Not just a dusty storage for old objects, the Heritage Centre tells the great history of Red Lake in dynamic ways, serves as a neutral meeting ground and hosts wonderful events for the community. What will happen next? Only time will tell, but you can bet that it will be historic.